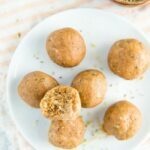 High protein, low carb protein balls made with coconut butter and hemp seeds! 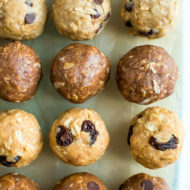 You’ll love the coconut flavor and the energy boost these coconut protein balls provide. Vegan + gluten-free. I’ve mentioned before that I’ve been trying to make sure I’m eating enough protein. Most of the time it’s pretty easy for me to get a good amount of protein at breakfast, lunch and dinner, but snacks are a whole other story. It can be a challenge to find protein-packed snacks that I actually want to eat! 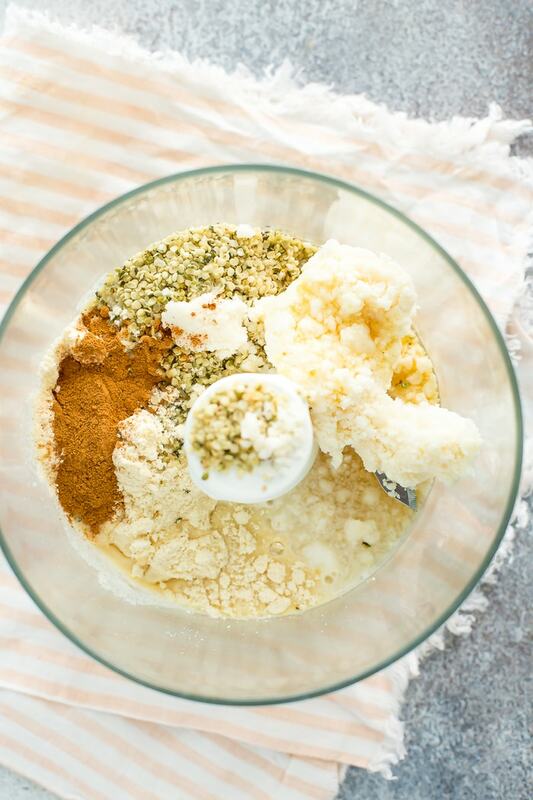 Plain Greek yogurt and granola has been my go-to for a while, but recently I was inspired to use protein powder, hemp seeds and coconut butter to make a low-sugar coconut protein ball for snacking. If you’re unfamiliar with coconut butter, it’s the most amazing thing ever — it’s a spread just like almond or peanut butter but made from coconut! You can find it at most grocery stores or simply follow my simple coconut butter recipe! I’ve made protein balls with nut butter a bazillion times and finally decided it’s time to make one with coconut butter. After softening the coconut butter a bit by putting the jar in a mug of hot water (like coconut oil, it becomes solid at temperatures below 70°), I combined the butter with protein powder and hemp seeds (extra protein!!) and added a little maple syrup for sweetness. The end result turned out great and I’m really excited to share the recipe with you. If you like coconut, you’ll love these balls! 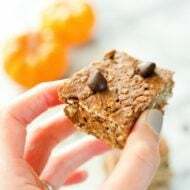 They’re perfect if you have a sweet tooth because they taste sweet, but are also super satisfying and filling from the healthy fat and protein. As it turns out, all of these balls are great as a pre or post workout snack, mid-afternoon pick me up or even an after dinner treat. Each ball is about 90 calories and has 6 grams of protein and 3 grams of net carbs! If you make these coconut protein balls be sure to leave a comment and star rating letting me know how they turned out for you! You reviews are so helpful for the EBF team and other readers. 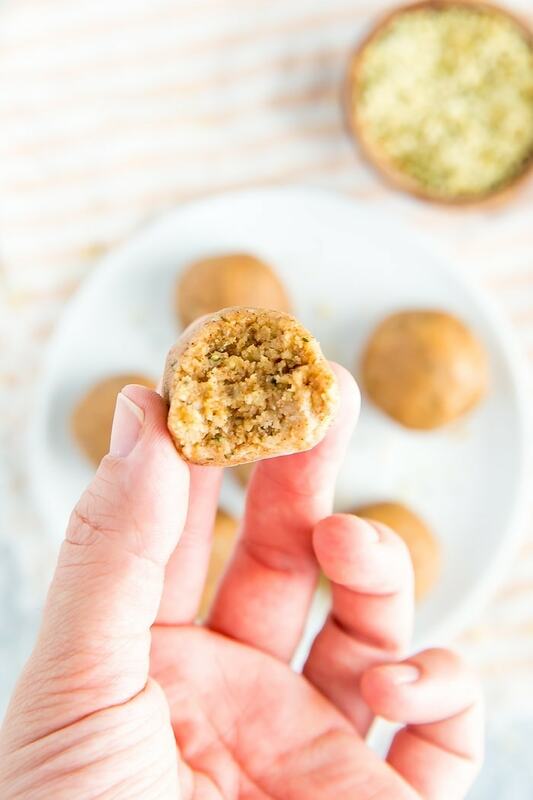 High protein, low carb protein balls made with coconut butter and hemp seeds! 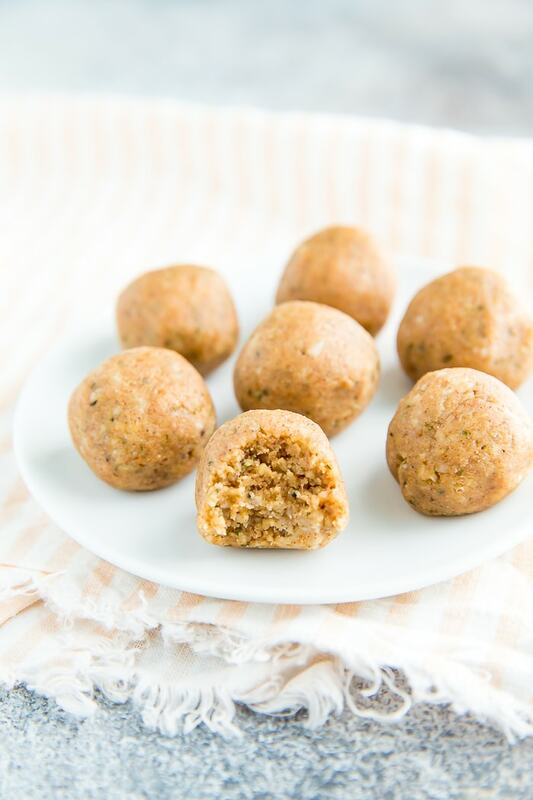 You’ll love the coconut flavor and the energy boost these vegan coconut protein balls provide. Put all ingredients in a mini chopper/processor and pulse a few times to incorporate. 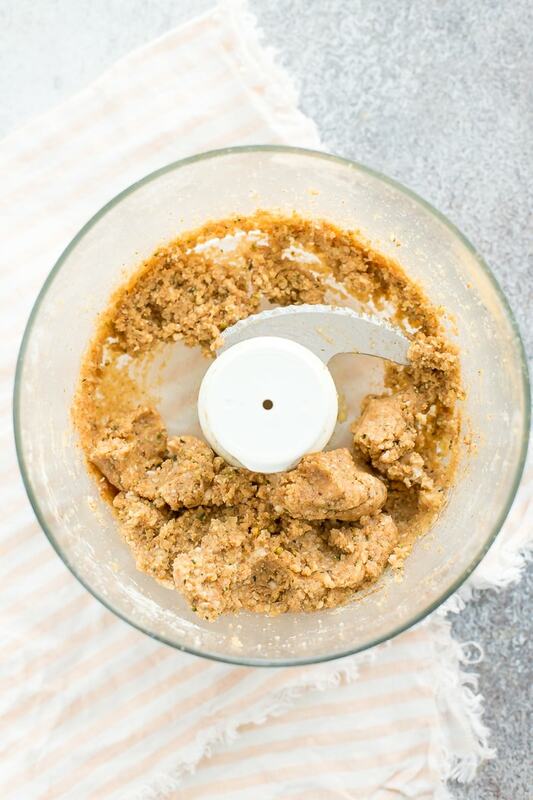 Give the dough a stir and start to roll the mixture (with your hands) into 1 tbsp sized balls. It should make about 8. If the dough is too crumbly add a few drops of water. Eat right away or store in an airtight container at room temp. 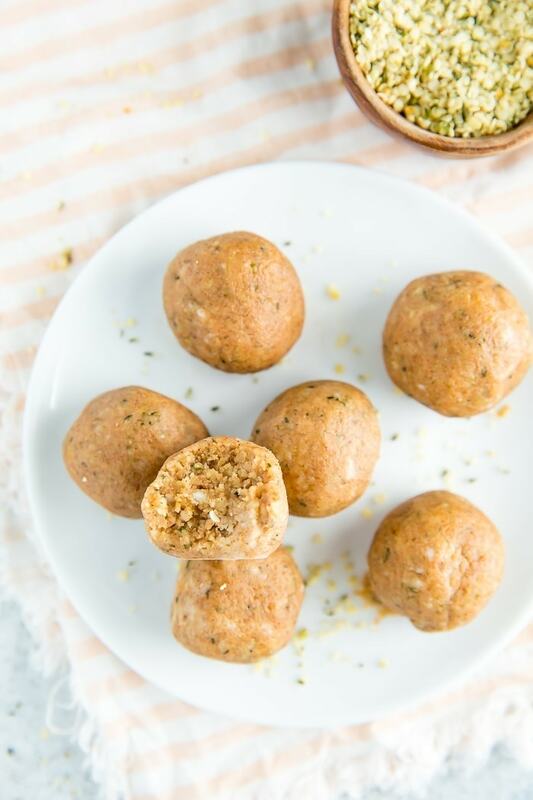 Use a vegan protein powder to keep these protein balls vegan. Here’s a list of my favorite plant-based protein powders. So sorry I missed your medical news post – I’m praying that all gets better. I don’t know if you’ve tried dry-roasted edamame (Sea Point Farms makes a dry roasted and a wasabi flavor) but I love snacking on them while I’m watching TV. Thank you lady, I really appreciate it. How many carbs are in the protein balls? 5g sis! How many points are they? ah good – something to do with that giant jar of coconut manna i still i have!!! Those look like a great snack, cool you created your own version. I love (snack) balls! Never added protein powder to them, but would love to try. Yummy! I love sweet hummus, plus I’ll put peanut butter on almost anything! Have you tried roasting chickpeas? You can give them a cinnamon sugar or honey coating. Hi Jess. Great suggestion for roasted chickpeas. I love those as well! What type of sweet hummus do you make? Awesome! I’m excited to check them out. Mmm…they all look great. I’ve been meaning to try both of those recipes, I add yours to that list! Love this post and can’t wait to try these. Many thanks. 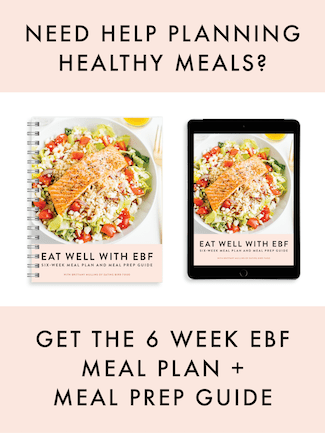 I’ve been assuming that I get enough protein, but I’ve been doing some reading lately, and I’m going to start tracking my nutrition more carefully so I can make sure I’m getting enough! Your recipe looks delicious! Best of luck for your health-related news. I’m definitely thinking of you and will look forward to an update after you get the second opinion! These look yummy, I’ve been trying to add protein to my meals to, What a great snack! Those are some good lookin balls. Love the title! Made me smile and I needed that on a Monday morning! Wow, those look really good!!! And pretty protein packed 🙂 These would be a great snack on the go! Definitely going on my ‘must make’ list for this weekend! I’m totally with you in regards to having trouble finding good and filling snacks (fellow pescaterian, here! ), and I’m always shying away from protein bars because of how much sugar they tend to include. Plus, I’m learning to follow the whole ‘no more than 5-6 ingredients’ rule when buying pre-made stuff …. im so so sorry about your scoliosis 🙁 ill keep you in my thoughts, but like you said, a second opinion never hurts. as for the balls…im definitely going to have to give them a try. 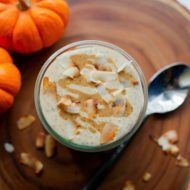 im craving coconut in a major way, so your adaptation looks like a winner. i need to get hemp seeds, this is, like, the 100th post ive starred with it as an ingred. I’m pescatarian too and get concerned about my protein intake at times too. There are only so many nuts you can snack on right, lol. I do love hummus and greek yogurt so I try to stick to those for snacks, but sometimes I just want something quick and no fuss on hand. I like the sounds of these truffles….have to try them. I posted a similar snack a few weeks ago. I only used raisins and almonds in a food processor then rolled in oats. These variations look great! I am the same with you that I like to snack on food that have some protein in them, I like adding protein for staying power and keeps me full. Have you tried Simply Bar protein bars? I’ve tried them and they are great for when you are on the go. But of course, homemade is always better when you can make them because you can control the ingredients. I want to try these balls. I have some hempseed that I haven’t opened because I don’t know what to do with them. WOW! THIS IS REALLY GREAT! THANKS FOR THE RECIPE AS ALWAYS! I have been buying “nut protein balls” at the health food store for 2$ each. Its nice to have a recipe to make them now. 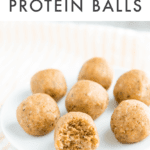 I’ve been looking for some protein ball recipes and these look great, thanks! That is an impressive amount of protein for each ball! I’m the same; I’ve used nut butters in SO many energy ball recipes, I’m excited to try something new! Any suggestion for a substitution for hemp seeds? I love simple and straight forward recipes like this! There’s no way I can mess this up AND they look delicious!! Hi, I’m wondering if these can be stored and eaten from freezer. If not how long do they last in airtight container. Great question. You can 100% store them in the freezer, but they’ll probably be too hard to eat frozen, so I’d recommend transferring them from the freezer to the fridge to thaw a couple hours before you want to eat them. For storage, they should last 1-2 weeks in an airtight container in the fridge.